From Sept. 2013 to May 2014 I helped co-design and facilitate an open, online course for educators (Open Online Experience 2013) on topics ranging from connected learning to digital literacy to digital storytelling to open education. The domain we had is no longer kept up and has some other website on it, so you can’t get information there. But you can see a couple of other posts about it under the OOE13 category here on my blog. In this post and the next one I’ll be pasting in Tweets from Twitter chats we had in April of 2014, when I was in charge of that month’s topic, open education. Now that storify.com is going away, I need to archive what I had there, here on my blog! I like to keep track of various things I’ve participated in, such as giving talks, facilitating workshops, etc., and this post is part of doing that. On March 10, 2016, I was part of an amazing panel of people talking about “Engaging Students in Open Education,” as part of Open Education Week at UBC. 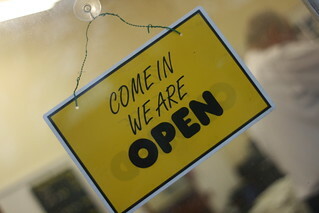 Open education is a hot topic on post secondary campuses these days. This year UBC saw the #textbookbroke campaign led by the Alma Mater society – advocating for the use of open textbooks and open practices in the classroom to reduce costs for students; the adoption of open textbooks and resources in large multi section physics and math courses; and the continuing development of open teaching practices with Wikipedia projects and student produced, openly published content. How do we engage students with open educational practices that go beyond making their work public to making it re-usable or available for others to build on? Why is open education important to students and to what extent can it enrich the teaching and learning environment? Lighting Talks: Each speaker will present for 8 minutes and respond to questions for 5 minutes. This will be followed by a broad panel discussion about open practice. Link to the recording on the Ike Barber Learning Commons website. I love doing these sorts of things because I get to learn about what interesting things others are doing on our campus and beyond! Posted in My presentations, Open Access, open ed, OER and tagged OER, open education on April 13, 2016 by Christina Hendricks. I have been one of a team of facilitators for a series of workshops on open education that we’ve run at UBC from December 2015 to May 2016 (we haven’t done the last one yet!). The idea behind having this series is that we might be able to go into more depth into various topics than we could cover in a single workshop on the broad topic of open education. It has worked well for that, though of course the people that come to the later ones are not always the same as those who came to the earlier ones, so we still always have to do some intro work at the beginning. Still, I think this model works pretty well. One thing I really like about what we’re doing is that we have used the model of the “assignment bank” from #ds106 and the challenge bank from #udgagora to create challenges that participants can do during the workshop. We were able to do this because Alan Levine kindly put some code up on Github to set one of these banks up as a WordPress theme. Now, I didn’t use that code to set up our challenge site (I only wish I could do that), but Lucas Wright of the Centre for Teaching, Learning and Technology at UBC did. Here’s the challenge bank we’ve been using for our workshops–super cool! We will keep this challenge bank and have people add their answers as we do this series again in the future (and we have one more workshop to go!). And I wanted to embed our slides, too. Here are the slides for the first three workshops (I’ll add the fourth when it’s done, if I remember). This was an introductory, overview workshop covering a number of things in open ed. Near the end of May I worked with Jon Festinger and Will Engle to do a 1.5 hour workshop on how using and creating Open Educational Resources (OER) can have pedagogical value in courses (beyond saving students money, which is also important). You can see the basic abstract for the session in the wiki page embedded below. Click here to see our slides for the workshop, on Google Slides (or see below). We also created a wiki page for the event, which has numerous link to resources. We also tried to get small groups to post answers to discussion questions on the wiki, but as the event was held in the late afternoon, a bunch of people left when it was time to do the small group activity (I guess many instructors, like many students, think the “real action” is in the presentation rather than the group discussion!). The wiki page for the workshop is embedded below. "Increasing Student Engagement through Open Educational Resources" is a workshop held during the CTLT Institute in May 2015. Open educational resources are educational materials (text, video, audio, and more) that are licensed to allow others to reuse, revise, remix, redistribute, and retain them free of cost. There are numerous pedagogical benefits to both using OER and creating OER in courses; this workshop will focus on a few of them, including the following. Asking students to create OER in courses means, in part, asking them to create things that are available to and of use by other students in the course (both past, present and future) and by people beyond the course. Assignments that are read only by an instructor and/or teaching assistant can seem to be what David Wiley calls in a blog post “disposable”: “assignments that add no value to the world – after a student spends three hours creating it, a teacher spends 30 minutes grading it, and then the student throws it away” (Resource here). If, instead, student work is adding value to the world, contributing to a larger body of knowledge that can be used by others, it is much more likely that they will be engaged in working on it and try to make it as good as possible. Examples of such assignments could be student blog posts, student-created web pages or wiki pages, videos, and more that others can see/hear/interact with and learn from. Another example that will be discussed in the session is having students edit an open textbook and share their edits openly. 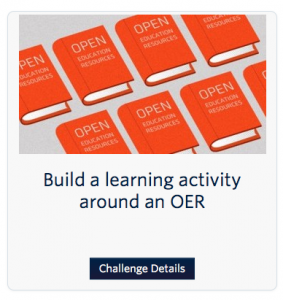 Using OER in courses means asking students to read/watch/listen to/interact with educational materials for the course that are publicly available and licensed for reuse and (often) revision. Finding and assigning OER can allow for presentation of material in different ways: e.g., a textual resource can be augmented through finding and using a diagram, an image, a video, another text that explains things differently, etc. This can help both engage students and improve their understanding of course material. Further, if the OER are licensed to allow revision, students can edit them or mix them with other resources to create something new, both helping their own leaning and contributing OER for others to learn from. In this session we will all discuss together the various kinds of open educational resources, including open textbooks, how to find OER for your courses, and several of the pedagogical benefits of creating and using OER. Will Engle is a strategist for open education resources at UBC's Center for Teaching, Learning & Technology. He engaged with projects that are leveraging emerging technologies, approaches, and pedagogies to support open learning. With a background in library science, Will is interested in understanding and supporting the removal of barriers that limit access to education, information, and knowledge. Jon Festinger, Q.C. (LL.B., B.C.L. 1980 McGill University) is a Vancouver, British Columbia based counsel and educator. He is an SFU Professor of Professional Practice and a faculty member of the Centre for Digital Media. Jon has taught media, entertainment and communications law topics at the UBC Faculty of Law for over two decades, as well as teaching at various times at the UBC Graduate School of Journalism, the Thompson Rivers University Faculty of Law and the University of Victoria Faculty of Law. He is the author of the first edition of “Video Game Law” published by LexisNexis in 2005, co-author of the 2nd Edition published in 2012. The open and on-line components of his courses can be found here & here. Jon was named a member of Creative Commons’ “Team Open” in 2014. Christina Hendricks is a Sr. Instructor in Philosophy at UBC, and she also regularly teaches in the Arts One program. She has been a proponent of open education for several years, having participated in and few open online courses and been part of the design and facilitation team for others, including one with Peer 2 Peer University called Why Open?, and a course on Teaching with WordPress. She uses as many open educational resources in her teaching as she can, and posts many of her teaching materials as open educational resources herself. Click on your group number to go to the page where you can type in your answers to the questions in the group activities during the session. The slides used during the session can be found here (on Google Slides). Please add other examples that you know of, below! UBC Copyright Guide for Open Courses and OER UBC Copyright Office guide to copyright questions for open courses and open resources. Introduction to Openness in Education - An open course from David Wiley that provides a broad overview of the ways in which openness impacts many areas of education – curriculum, instruction, learning, policy, technology, research, and finance, among others. Posted in My presentations, Open Access, open ed, OER and tagged OER, open textbooks, student as producer on June 13, 2015 by Christina Hendricks.